Reclaiming the Principalship is an invitation to you to be the type of school or district leader who doesn’t corner students and teachers into compliance, but creates an environment in which learning is simply a way of life. 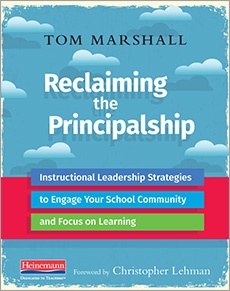 Tom Marshall targets some of the biggest current issues principals face, including scheduling, teacher evaluations, isolation, improving academic achievement, and school climate. Reclaiming the Principalship can help you figure out how to let learning guide the many, many decisions you make each day in your work. In this sample, you will find the TOC, the Foreword by Chris Lehman, and the Introduction. Start reading now and learn how to hold on to being a teacher and learning, even while you occupy the principal’s office.